The Big Sur region covers approximately 90 miles of the California coast along Highway 1, made up of a collection of state parks and attractions. Located between the major centers of San Francisco and Los Angeles, the area is generally considered bounded by Carmel in the north and San Simeon in the south. Derived from the Spanish Le Sur Grande (The Big South), the landscape consists of a number of rolling hills that end abruptly in steep seaside cliff frontages at the Pacific Ocean. Large upcroppings of rock break from the pounding surf, where expansive sand beaches are also featured. We begin our exploration of the coastline watching huge breakers crash against the rocky shore at San Simeon State Park, as the sky provides an impressive array of cloud formations. Shore birds scavenge amongst the swells on sandy beaches, as buttressed rocks inspire sea spray to shoot dozens of feet in the air. We next go to a manmade attraction, which is a National Historic Landmark and State Historical Monument, Hearst Castle. Here we see its opulent pool, and many of the buildings at the site. We also visit Lime Kiln State Park and the Point Sur Lightstation State Historic Park. Even as we travel inland to the forests, water is the dominant feature, whether babbling brooks, rushing creeks or McWay Falls as it tumble to the beach at Julia Pfeiffer Burns State Park. The Pacific Valley contrasts pastureland where cattle graze against a backdrop of the Pacific Ocean. The sky also plays an important role in this video, as clouds parade in time lapse shots, or spectacular sunset views are presented. Natural landmarks such as Lone Pine are shown, as is a variety of the region's wildlife, from mule deer, rabbits and rodents, to sea creatures like seals sunning on kelp covered rocks, or crabs and starfish scurrying about tidal pools. Some of the undersea worlds from the Monterey Aquarium are also seen, as are a number of the highway bridges that edge the shoreline, such as the one a Bixby Landing. 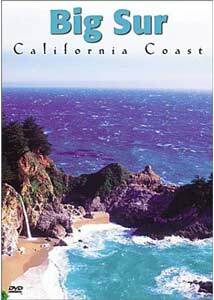 While the disc was solicited to retail and the available cover art is titled Big Sur California Coast, the actual program name is Big Sur Coastline. Like other titles in the Wilderness Video collection, the natural ambient sounds are interwoven with soft classical and contemporary music, for a relaxing auditory and visual experience. The sights and scenery of the area are broken into chapters for each area, providing a glimpse at some of the things to see on this rugged coastline. Image Transfer Review: Video quality is quite good for the most part, with strong, highly saturated color, and sold blacks. There is some noticible edging on some high contrast areas, particularly land-to-sky transitions. The image isn't overly sharp, but detail is reasonable. There are some visible compression artifacts in places, along with some aliasing and a few minor video dropouts and print defects present. Audio Transfer Review: Stereo audio is generally clean and good sounding. A few of the background music tracks have clicks and pops in them, but utilize the field with a good deal of directionality. Location audio is primarily mono. Some of the interchapter editing is a bit rough, with bleed from other music tracks being heard faintly. Extras Review: There are no extras other than 16 menu selections. Another enjoyable addition to the Wilderness Video collection, which also includes a number of National Park titles. The Central California coastlands, and the mighty Pacific Ocean take centerstage in this collection of scenes from the Monterey area.